Yummo Mummo | Jump(suit)ing for joy ! I have hit three trends for SS15 in this post. 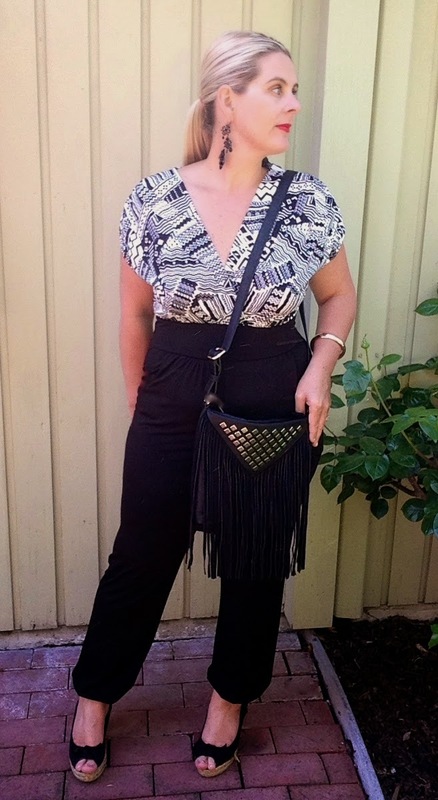 Those being – tribal print, jumpsuits and fringe accessories! 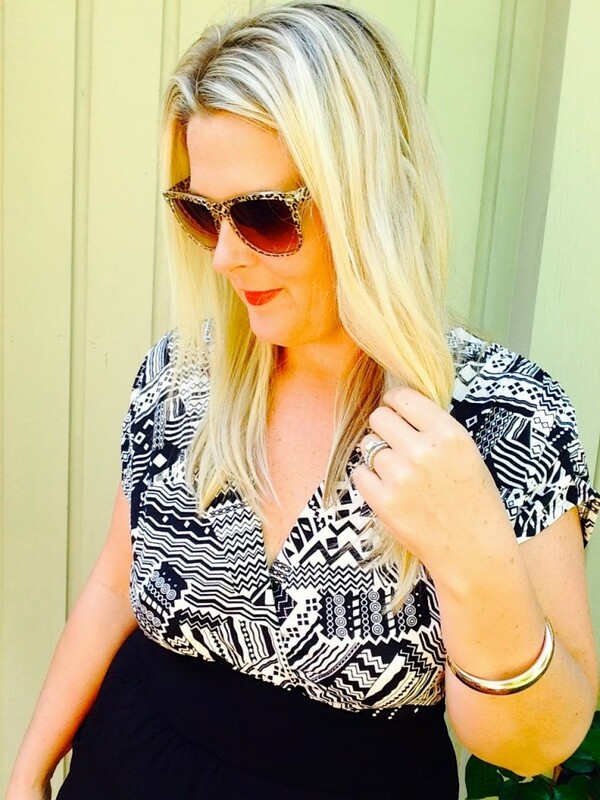 I am a mama on a budget, a lot like everyone else, and I love to look for fun outfits that won’t break the bank but will let me shake up my style and play around with fashion trends. Jumpsuits were huge last Spring/Summer and I am thrilled to see them back again. This time you will see them strapless and in more daring prints, like floral and in bell bottoms. I read a wonderful post recently by a fabulous blog I follow called AskSuzanneBell www.asksuzannebell.com. For a link to this post, click HERE where you can read about different ways she has styled jumpsuits including different shoes to wear! I love the design of this jumpsuit. The cinched waist is my favorite part as I like how it pulls me in at all the correct places for delicious juicy pear shapes. This jumpsuit is so comfortable, I want to wear it to bed! 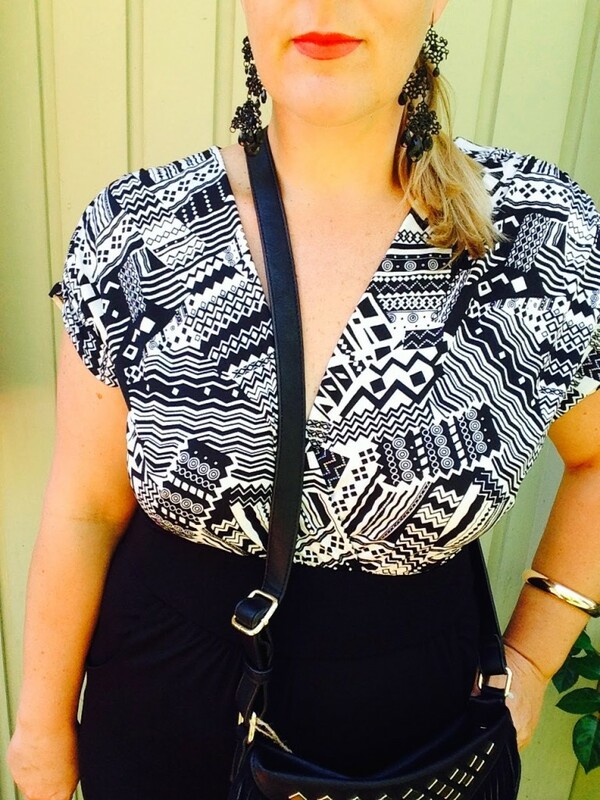 The only burst of color on this little number is the bright red lipstick I so adore! Marshalls is a fabulous place to hunt for designer labels at ah-mazing prices. By pairing my Marshall’s buy with some items from my own wardrobe (chandelier earrings and wedges), I got this fabulousness for $65! Yes, $65! Besides the fabulously fringed bag, might I suggest switching things up a bit with a black felt hat or some fun cheetah sunglasses to add some more fabric/pattern to the mix. FUN! 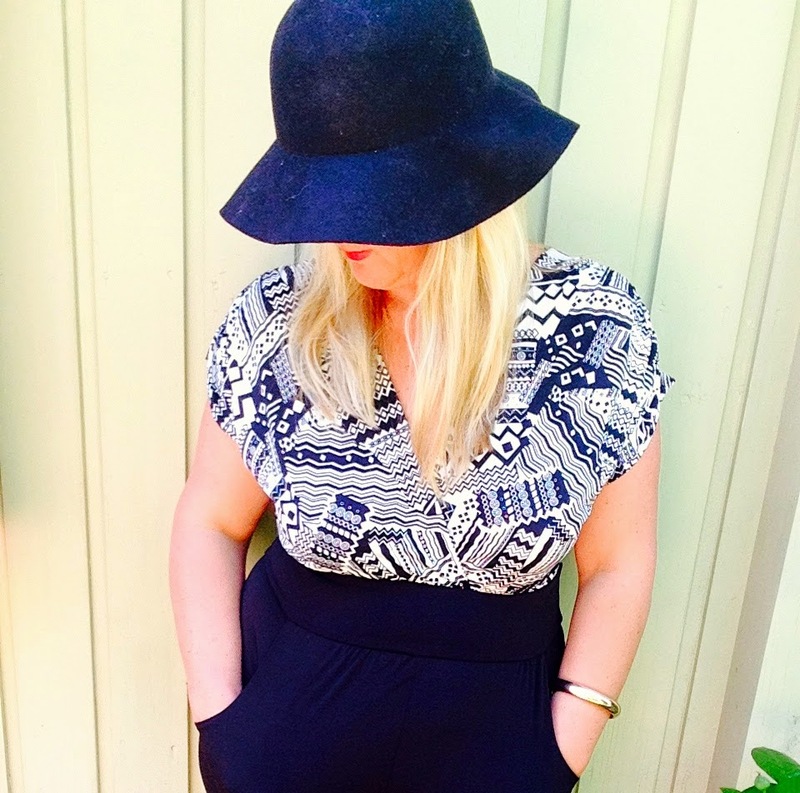 Jumpsuit- love! 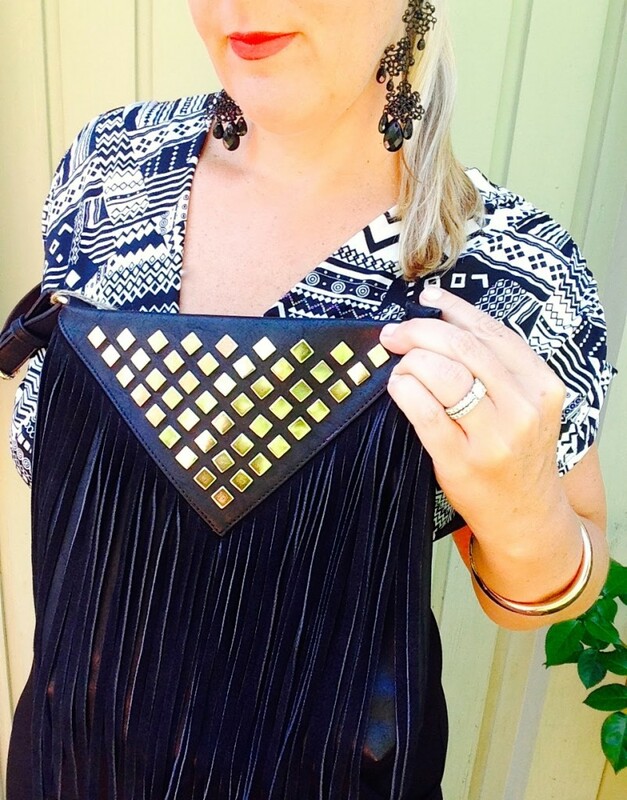 Fringe – love! 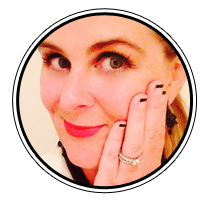 Your fabulousness – love! I love it all! I've been wanting to get myself one and just actually order a new romper from Hautelook for $35! 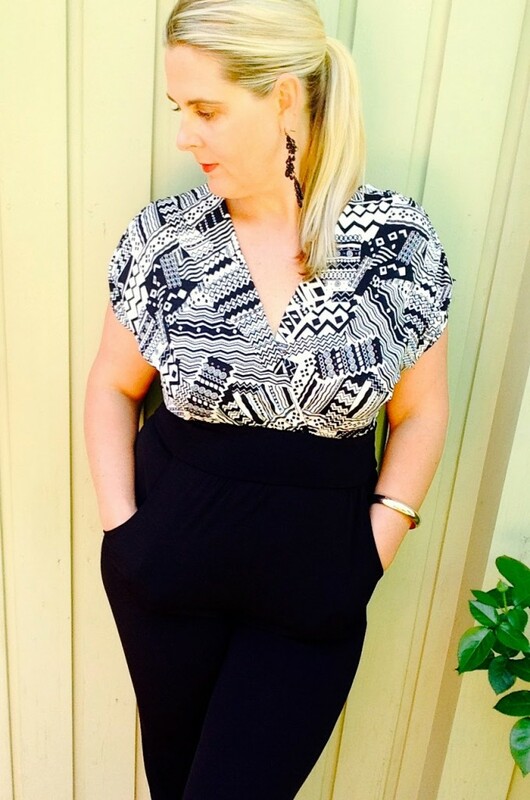 Looking forward to seeing you in person in this fab jumpsuit! You never know Kanda, you might just see me rock up to baseball practice in it, I am YummoMummo after all! Sooo glad you love it. I'd love to see the romper when it arrives. Spring has certainly arrived! Your right Laura, I am seeing so much fringe coming out in the stores now. What fun! You did a lovely post on fringe on http://www.whatlauralovesuk.com. I felt this black bottom was more slimming on a body type like mine. Although, I'd still love to try a cute floral jumpsuit. This jumpsuit really does suit your figure. I find jupsuits to be a little tricky but you've got yourself a good 'un there! The print is lovely too! Not overbearing, just a great contrast betwen colours! Hi Halima, I think I definitely found my one. But believe me when I say I kissed a lot of frogs to find my jumpsuit prince, just gottta keep looking for "the one"! Thanks so much for reading! Thanks for reading Iris. Definitely had some fun playing around with some fringe! Thanks Danielle! Have a great day! This is such a fun outfit! I don't usually like jumpsuits, but I think you look amazing in this! Thanks Kristina. Glad you enjoyed reading and for your very kind compliment. Just brining the wonderful women of the world out there some YummoMummo inspiration. Love love this jumpsuit on you! It's so perfect for you! 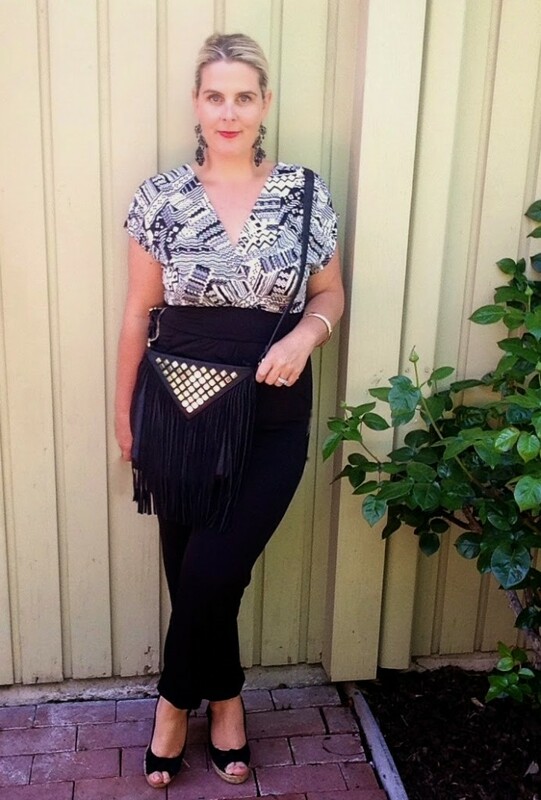 That fringe bag is pretty fab as well! ? great post!! Jumpsuits are so fun and I love how yours looks like two separate pieces!